The LORD of MAJESTY, AL-JALEEL, is the One Who is perfect in His epithets, the Most Great is the One Who is perfect in His Self,whereas the Supreme is the One Who is perfect in both. Allahisunparalleled; He has no partner or equal neither in Himself, His Attributes,nor in what He does. He is the Exalted One; all beauty, perfection, sublimityand splendour are but glimpses of His Light and traces of His Sublimeepithets. Thereupon, to look at His Sublime Countenance on Doomsday isfar greater than all the bliss of Paradise, “Blessed be the nameof thy Lord, full of Majesty, Bounty and Honour.” (RAHMAN, 78). 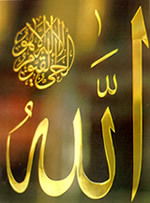 Glory be to the LORD of perfect MAJESTY andabsolute Greatness, He is Allah.